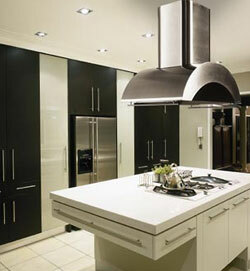 Under cabinet kitchen ventilation fan is by far the most common form of kitchen exhaust solution in modern homes. These mechanical devices are installed within the range hoods that are mounted about the cooking surface and below the kitchen cabinets. There is a wide range of design options and finishes of the range hoods that you can choose from when you decide to install under cabinet kitchen ventilation fan. The ventilation fan installed in the kitchen must move and vent more air, which can go as high as 300 CFM, than the one installed in the bathroom. In terms of power rating, the CFM of ventilation fans ranges from 180 and can go as high as 1500. Stale and humid air is released to the external environment through the ducting of the kitchen ventilation system. This type of ventilation unit is most effective when it is positioned in such as way that it extends out just above the stove and is as close as possible to the stove top. Ventilation fans which are installed on the wall are considered more effective than those that are installed as island ventilation units. Under cabinet kitchen ventilation fan must be installed following the guidelines of the manufacturer and according to the building code. In order to obtain optimum performance from your ventilation system, you must aim for short and smooth duct runs with only a few turns. You must use aluminum duct tape in sealing the duck joints to prevent leakage of noise, moisture and air. Make sure that you insulate the ductwork to avoid problems with moisture later. And if the design allows it, the ducting must slant slightly along the horizontal runs towards the exterior so that any condensation is drained outside by force of gravity. It is important that you strictly follow the recommended cleaning and maintenance schedule of the kitchen ventilation system. One of the most critical components of the kitchen ventilation system that need to be cleaned regularly is the grease filter. These filters, which are normally made of aluminum mesh, are cleaned with ordinary detergent and warm water. You must also regularly replace the grease filters and traps as these can be potential fire hazards. Grease fire is one of the potential risks of having poorly maintained kitchen exhaust systems.